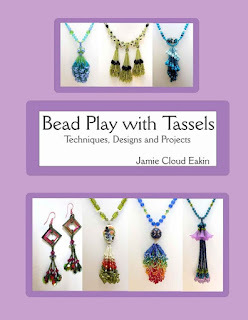 One of my favorite bead embroidery artists, Jamie Cloud Eakin, has written another book compiling her years of wisdom! This one, as you can see, is called Bead Play with Tassels, and in it Jamie takes you through step-by-step how to add these delightful elements to your work. Tassels can stand alone as pendants, or they can be added to other work, and Jamie covers both. She starts with what she calls minimal and standard tassels, and moves you gently into creating pom pom and spiral styles. The spirals are particularly arresting, and I love the way they look on their own. The illustrations are very easy to follow, and I particularly liked the chapter on how to attach the tassels to your work. Coupled with her book Bead Play with Fringe (my review), Jamie has put together a helpful guide that you are going to want to have. Bet you didn't know how many types of tassels it was possible to make! Just wanted you to know when I click on Jamie's book to buy it...I am re-directed to someone else book and not hers. Thought you might like to know.